Fortunately, there are a number of refinements that can streamline the product flow process. Finished product is conveyed into a scale, auger, counter, or other measuring system, which produces individual “charges” of product—enough to fill one package. Multihead weighers and counters combine product from multiple buckets in order to more quickly create a single, more accurately measured charge. 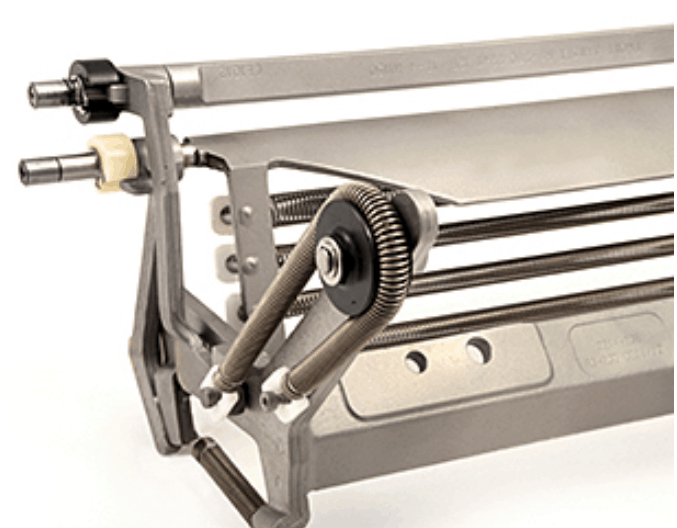 Charges must be compiled and released into the inlet chute of the forming set with precision timing and accuracy so that they remain consolidated and separate from each other as they move through the packaging process. Faster and more consistent product flow into the measuring system helps to create this separation by producing more compact charges. The average product size is large in relation to the bag size. Oversized product units are occasionally present. The product is lightweight, oddly shaped, or has rough outer surfaces that slow its movement. As the charges move into the inlet chute, through the forming tube, and into newly formed bags or pouches, the spaces between them provide critical room for the jaws to close in order to seal and cut the package without interference from product contamination. When a charge encounters bottlenecks it can slow down, become strung out, and fail to completely fill the newly formed bag before the sealing jaws close, trapping product within the end seal. Even small amounts of product within the end seal can prevent the sealing jaws from providing the even pressure and heat transfer required to create quality seals, and product contamination can keep the knife from cutting properly. Blockages occur at bottlenecks when product gets stuck or when a charge is so delayed and strung out that it “bridges” together with the charge that follows it, creating an overflow of product volume that clogs the forming tube. Machine stoppage and operator intervention are typically required to clear blockages, resulting in costly waste and downtime. These components help to consolidate each charge within the film tube before it reaches the sealing jaws, helping to clear critical space for the sealing and the cutting of each package. 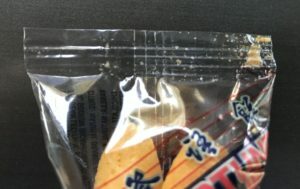 To ensure accurate product flow the bag closers and strippers should be regularly cleaned and maintained, and should be refurbished or replaced when worn. 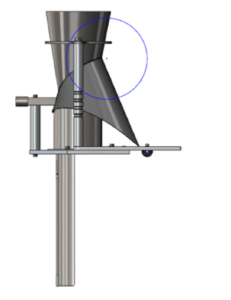 • Creates a more abrupt transition from the measuring system into the forming tube. • While this design works well for many applications, for some products and conditions the transition can be too abrupt and may create bottlenecks that increase downtime, reduce seal quality, and lower production rates. 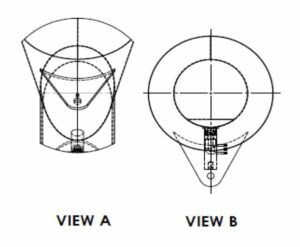 • The inlet cone is built into the tube, and the transition from large to small diameter happens more gradually, over a greater distance. • Since the angle of the built-in cone is steeper in front than in back, some parts of the charge pass through the bottleneck fractionally ahead of the other parts, minimizing turbulence that slows down and strings out the charge. • Provides a greater surface area, over the longest distance possible, from large to small diameter. • This design maximizes the cross-sectional area available for product to pass through to minimize bottlenecks and blockages. 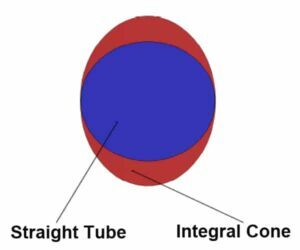 The image at right, with a view looking from above down into the forming tube, shows the larger surface area in the transition zone of an integral cone (red), compared to the smaller surface area in a straight tube (blue). High cut tubes provide an even larger transition zone. 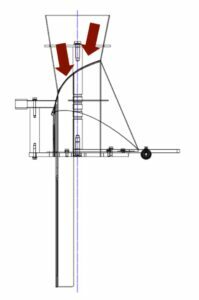 As illustrated below, on Integral Cones and High Cut Tubes the angle at the front (X°) is steeper than at the back (Y°), so that X° < Y°. These designs stagger the charge and help keep it from slowing down and stringing out as it moves through the bottleneck. The Integral and High Cut designs help stream product through bottlenecks and potential blockage points and can be crucial to maintaining product flow for many products, especially on high speed bagging operations. The entire charge enters the final bag earlier than if it had transitioned directly from the scales into a straight tube, helping to achieve faster speeds, larger doses, decreased downtime, or a combination of all three benefits while maintaining quality seals free from product contamination. 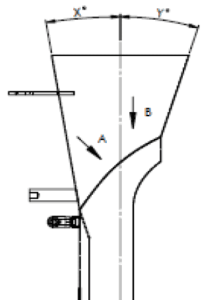 Even small deviations in the geometry and size of the inlet, feed tube, or forming set can disrupt the carefully choreographed sequence of events necessary to optimize product flow. Once the optimal design for your forming sets is determined, these components must be accurately and consistently fabricated—the first time and every time they are replicated. You should expect the same, dependable product flow and bag forming performance across multiple machines and with future orders of replacement forming sets, without resorting to lengthy, costly installation processes and modifications to achieve quality results. Greener Corporation works in partnership with Kenray Forming to provide solutions that improve product flow speed and efficiency. Kenray’s computer aided design methods and specialized fabricating techniques eliminate variability from order to order, so that you achieve reliable, consistent product flow and bag forming performance. • Determine the forming assembly design that optimizes product flow for your application. 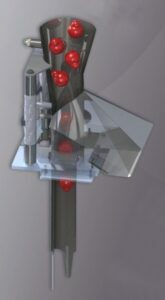 • Accurately and consistently provide the forming assembly designs that work best for you. • Supply bag closers and strippers for TNA machines that provide improved performance and lifespan when compared to OEM equipment. Are there opportunities to improve product flow on your packaging lines? Contact Greener Corporation for solutions that optimize packaging performance.